While the view from the tables in Nobu on the 57th floor of Tower 3 Petronas is fabulous, as always, our little group is perched on tall chairs along the sushi bar near the entrance. This time, the lure is not in the amazing skyline but rather, the man working magic behind the counter. Philippine-born Chef Micheole Chico Anung Dator, the new head sushi chef, had previously worked in Nobu Lanai in Hawaii and Nobu Malibu under Head Sushi Chef Toshiyuki Shiramizu. 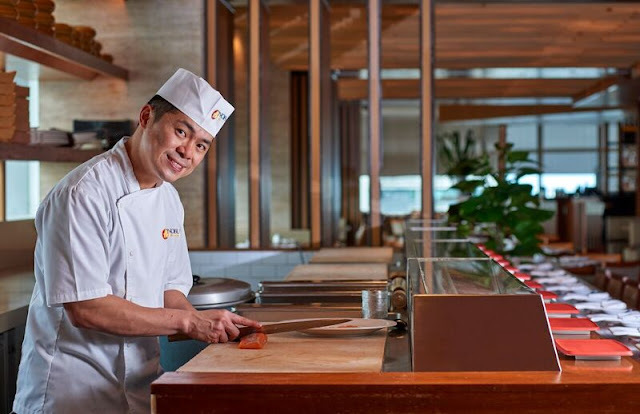 The affable chef is introducing himself to diners with his special Sushi Bar Omakase dinner in September. This is happening only on Tuesday and Wednesday, with limited seats for 11 diners, so do make reservations. We start the 10-course sushi culinary adventure with a triple treat of fish. Half the fun is watching Chef Chico at work, placing bits of jalapeno on the fish or drizzling sauces on top. He suggests that we eat from left to right; do as the man says – this really allows the palate to first appreciate the subtle flavours of the Yellowtail (Hamachi) topped with coriander and jalapeno with a drizzle of olive oil and yuzu. Then comes a slice of Red Snapper with chopped chives, garlic chips and yuzu soya sauce. Lastly, it’s the freshest Bluefin Tuna with a delicious citrus ponzu sauce. One of the nicest things about an omakase meal is that you never know what the chef’s going to come up with. It all depends on the freshest ingredients of the day, and sometimes, the chef’s mood. Glad to note that Chef Chico’s wearing a huge smile. Our second dish is baby red snapper sushi with lemon juice and sea salt. A bit of shiso leaf under the fish explodes in a minty burst when I chew. There’s really no need for additional sauces here. Then it’s Bluefin Tuna otoro with a drizzle of miso and topped with black caviar. But wait… just seconds earlier, Chef Chico had grabbed a blowtorch and fired away to melt some of the fat and sear the edges of the fish belly. The result: Otoro that sends me floating into a state of heavenly bliss. I close my eyes and allow the otoro to simply melt away in my mouth. Unfortunately, this somewhat reduces my pleasure a notch for next item, Hokkaido Scallop. Not that it’s possible to find fault with this sweet and succulent scallop, topped with cilantro, Peruvian chilli paste, soya salt (dried soya sauce) and a drizzle of yuzu lemon juice. Then we are offered a teacup filled with rice topped with fresh uni and ikura while Chef Chico gets busy preparing a salad dish. The salad’s an uncluttered dish with two pieces of daikon rolls stuffed with fresh salad leaves. A baby corn, halved, is lightly roasted and a cherry tomato adds a touch of red. The stars are a slice of baby Yellowtail and a Botanebi with a deepfried head standing upright in a defiant stance. The sweet prawn tail, with its delicate flavour and delectable texture, fights for attention with the buttery Hamachi. Binding all the ingredients together is a sweet onion dressing. After this, we get two pieces of maki with seaweed and rice enveloping grilled Unagi and Avocado – two of my favourite ingredients. For the 8th item, Chef Chico announces that Executive Chef Philip Leong will be preparing a hot dish, Umami Seabass. The thick slab of Seabass is marinated in a vegetable puree for 6-7 hours before it’s grilled and served with miso salt and pickled fruit. I can’t believe how juicy the fish is. When I finish, I am tempted, almost, to slurp the juices left on the leaf it’s placed on. By now, I am feeling rather full but there’s more. A bowl of clear soup with noodles, enoki mushroom and a sprinkle of scallions proves to be the perfect dish to cleanse the palate in readiness for dessert, a warm chocolate lava fondant with house-made green tea ice cream and a wafer of black sesame seed, served in a lacquered box.